THOUSANDS OF PEOPLE in Southern California have fled a deliberately set blaze southeast of Los Angeles, after the state’s governor requested federal aid to help battle a deadly fire elsewhere. A blaze known as the Cranston Fire, and the Northern California Carr Fire in which two firefighters have lost their lives, are among the most serious of several blazes burning in the most populous US state. A third major blaze, the Ferguson Fire, has encroached upon the Yosemite National Park in central California, forcing the partial closure of the popular attraction and leading to the death of a firefighter several days ago. More than 1,300 firefighters were battling the fast-moving Cranston Fire, which began on Wednesday and forced the evacuation of about 7,000 people, the US Forest Service said. It added that the hazards created by Cranston and another fire have caused the temporary closure of all US Forest Service lands within the Santa Rosa and San Jacinto Mountains National Monument. A 32-year-old man has been arrested and charged with 15 arson counts, including for the Cranston Fire. “Fire dangers continue to rise throughout CA. Make sure your family and friends are prepared to evacuate. Be alert,” warned California’s Office of Emergency Services. Governor Jerry Brown yesterday asked for federal assistance “to save lives and to protect property,” his office said in a statement. He asked for help including military aircraft, shelter supplies and water for 30,000 evacuated residents in Shasta County, in north-central California, where the Carr Fire has grown “uncontrollably,” the statement said. Brown declared a state of emergency in Shasta and ordered National Guard forces to assist the 3,400 fire personnel already trying to contain the Carr Fire, which has destroyed 500 structures and more than 48,000 acres (19,400 hectares). “Two firefighters have been killed in the Carr Fire. A private contractor (operating) a bulldozer died yesterday and a Redding City firefighter was killed in the evening,” a spokesman for Cal Fire, the state’s Department of Forestry and Fire Protection, told AFP. Cal Fire had announced hours earlier the death of the bulldozer driver. The Carr Fire outside Redding swept across a river late Thursday and engulfed the western part of the city of 90,000 people, said Bret Gouvea, a Cal Fire commander. Scott McLean, a spokesman for the department, said law enforcement colleagues were “doing evacuations as fast as we can” because the fire was moving so fast. “There have been some injuries to civilians and firefighters,” he said. “Continued hot dry weather is forecasted for the remainder of the weekend with triple-digit temperatures,” Cal Fire said on its website. Last year was the worst on record for wildfire devastation in California, with more than 40 deaths and around 9,000 structures destroyed, following fires that ravaged the Napa and Sonoma wine regions. Email “Thousands flee deliberate California fire that has destroyed 500 buildings”. 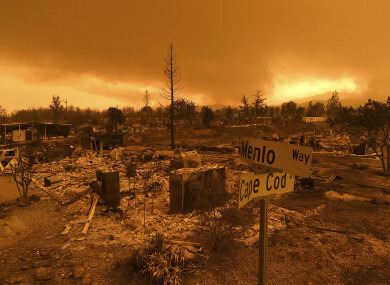 Feedback on “Thousands flee deliberate California fire that has destroyed 500 buildings”.